Katherine Smith has been awarded the Bleddyn Davies Early Career Prize for Policy & Politics in 2013. Her winning article is ‘Institutional filters: the translation and re-circulation of ideas about health inequalities within policy’. Working as part of the University of Edinburgh’s Global Public Health Unit, Dr Smith has expertise in the fields of policy construction and knowledge transfer in the field of healthcare; and this article exemplifies the salient and policy-relevant research in which she is engaged. In this article, Dr Smith seeks to account for the varying extent which research has informed policy-making in the field of health, despite the ostensible commitment to evidence-based policy-making by successive administrations across the United Kingdom. The article draws on an impressive programme of interview- and desk-based research to identifies four broad ‘journeys’ along research-informed ideas about health inequality have travelled during the policy process, ranging from ‘successful journeys’ in which research has clearly informed subsequent policy outcomes, through to ‘fractured journeys’ whereby only specific elements of research-based ideas have found their way into policy. 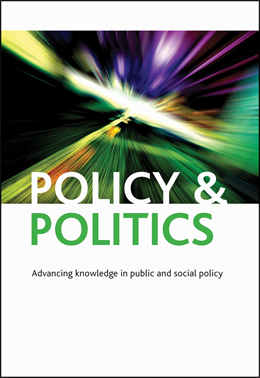 Through her analysis of these different trajectories, Dr Smith highlights critical lessons for both policy-makers and academics; and in particular the findings of the article were instructive for the many readers of Policy and Politics for whom the ‘impact’ and policy-relevance of their research is a key objective. Katherine Smith is a Reader in the Global Public Health Unit, School of Social and Political Science, University of Edinburgh.